For people who take multiple medicines, remembering what to take and when to take it can be tedious and aggravating. 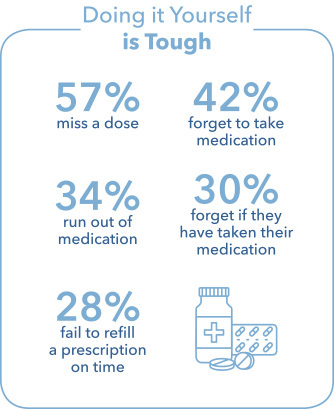 It’s easy to forget or confuse pills – and missing or mixing medications can have serious effects. Without a system in place, patients struggle with compliance, which leads to more hospital visits, the advancement of disease, more dependence on others, and a lowered quality of life. We’re proud to partner with Medicine-On-Time® (MOT), a medication management system that eliminates the time-consuming hassle of keeping track of multiple medications. With their simple, color-coded frames, medications are pre-packaged into the proper dosages and clearly labeled for easy, consistent compliance. With over 1 million patients served and more than 250 million prescriptions filled across the U.S., MOT is a proven, effective solution for medication management for 30+ years. One visit, all your prescriptions. Instead of waiting in line at the prescription counter every time you run low on a medication, let your Medicine-On-Time® pharmacist synchronize all your refills and prepare one package, well in advance of you running out. 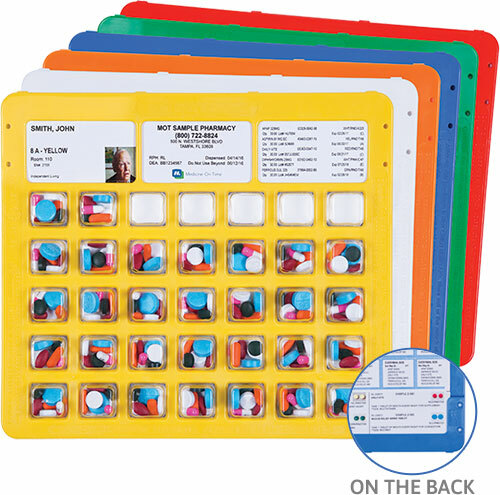 You will receive your medications organized into color-coded calendar cards for an easy and reliable system. Remove a single dose, or take several with you for added convenience on the go. Each dose cup loaded into your calendar card has been expertly prepared by your pharmacist. Your personal dose cup contains exactly the pills you need to take and is clearly labeled with the contents and the precise time to take them.